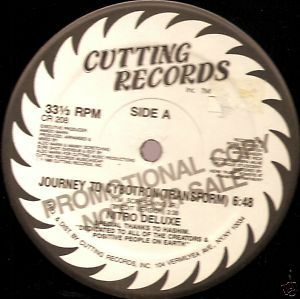 Cutting Records CR 208 white label promotional vinyl single (1986) Nitro Deluxe Journey to Cybotron (Transform) 6:48/7" edit 3:38//Transform to Dub (Cybotron) 6:30/Mental Transformation 5:09 Vinyl is near mint. Labels are stamped promotional not for sale; price sticker was removed from side A label, causing a small tear. Generic sleeve shows signs of wear.